Leon Rhodes, a highly respected guitarist who played with some of country's greatest artists, died Saturday at his home in Donelson, TN at the age of 85. Rhodes began playing guitar at the age of 14 and, two years later, he was already playing on the Big D Jamboree and at Dallas area recording studios on sessions for artists like Ray Price and Left Frizzell. In 1959, he became a member of Ernest Tubb's Texas Troubadours in a band that also included Buddy Emmons, Buddy Charleton, Jack Greene and Cal Smith. Rhodes was best known for his lightning fast and exceptionally accurate guitar playing, bringing him the nickname "Honey Fingers". Rhodes left Tubb in 1966 and, after an attempt by Ernest to stop him, he joined the band for the Grand Ole Opry. 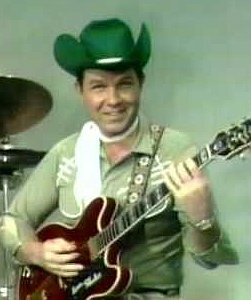 Two years later, Leon began a 25-year run in the house band for the series Hee Haw. It was also during this time that he came off the road and began specializing in studio work where he played on the recording of some of Nashville's best including Reba McEntire, Waylon Jennings, Loretta Lynn, B.J. Thomas, John Denver and George Strait. In 1999, his time at the Grand Ole Opry came to an end when the management decided it needed to update the band. Rhodes said at the time "I understand that the boss man wants to make a change, and there's really nothing that I can do about it except accept it. I just don't want to leave the staff band. I want to wear the coat, I want to be in the picture. I think that's what's broke my heart." After leaving the Opry, Rhodes continued to play in the bands of Porter Wagoner and the Whites. He retired in 2014. Rhodes is survived by his wife, Judy, eight children, 25 grandchildren and 17 great-grandchildren.